Uporaba: 50-200 ml peletov za 100 L vode, nekaj novih pelet dodate starim po cca. 6-12 mesecih. The positive effects of NP-reducing BioPellets on water quality are based on the principle of immobilization. Waste products from the water, mainly nitrate and phosphate, are converted into bacteria. This keeps the aquarium water clean. The new formula NP-reducing BioPellets are composed of 100 % pure biologically degradable polymers that can be placed in a fluidized filter or filter canister. 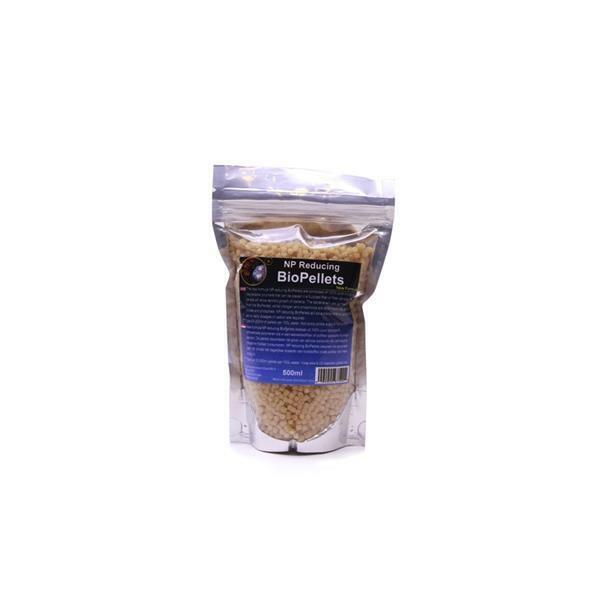 The pellets will allow aerobic growth of bacteria which consequently will consume nitrate and phosphate simultaneously. The bacteria will use up the carbon from the BioPellets, whilst nitrogen and phosphorus are taken from the water as nitrate and (ortho)phosphate. This conversion of organic BioPellets (together with inorganic nitrogen and phosphorus) into microbial biomass is called immobilization. In addition, anaerobic layers will develop, resulting in additional denitrification. The surplus of bacteria will be consumed by filter and suspension feeding organisms such as sponges and corals, or skimmed off by a protein skimmer. On average this “solid wodka method” takes 2-4 weeks to give rise to sufficient bacteria to allow nitrate and phosphate levels to drop. The main advantage of this method over using Wodka or sugar as a carbon source is that NP-reducing BioPellets stimulate local growth of bacteria in a filter compartment, instead of all over in the aquarium where they may clog up pipes and hoses. They also prevent the growth of cyanobacteria, as the bacteria growing on NP-reducing BioPellets will compete with these phototrophic nuisance microbes. Finally, NP-reducing BioPellets will save the aquarist a lot of time, as no daily dosages of carbon are required. Morske rdeče makroalge obogatene s česnovim izvlečkom.